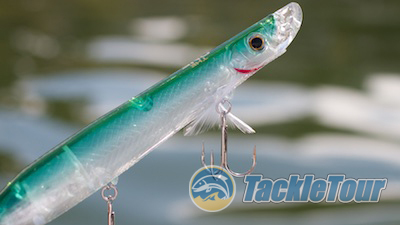 Introduction: Pencil popper topwater baits have the reputation of being a bait more tailored towards striped bass rather than largemouth. Perhaps it's due to their size. But those in the know have been fishing pencil popper type baits for black bass for a long, long time. Several years ago, Paycheck Baits debuted their interpretation of this under the radar bait and today, we bring you our review of it. Presenting, "The One", by Paycheck Baits. 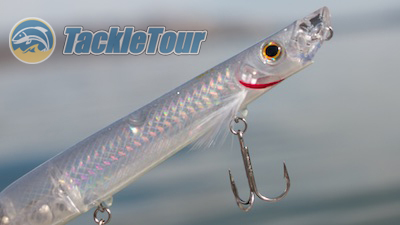 Quality/Construction: Paycheck Baits's The One, is a five and three quarter inch (5 3/4") bait weighing a full ounce. There are about eight different finishes all executed very nicely. 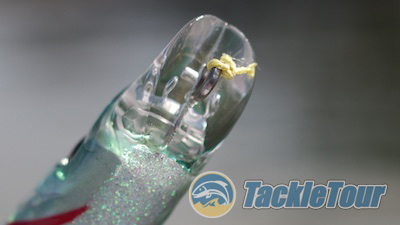 Detailing, as with all pencil popper baits, is minimal and the hardware is of average quality. Craftsmanship is very clean. "The One" is Paycheck Baits's interpretation of the Pencil Popper. Performance: I have fished The One on and off for several years now on a number of different rods and reels. I like it best on a rod 7'-0" or over in length, heavy power, but with a soft tip. Speed of the reel does not concern me as much as the line. I prefer fishing this bait on nylon monofilament or on a nylon monofilament leader. It's available in about eight different colors. Castability : This bait weighs a full ounce and has one very large weighted bearing in the back with two smaller bearings stacked right behind the big one. 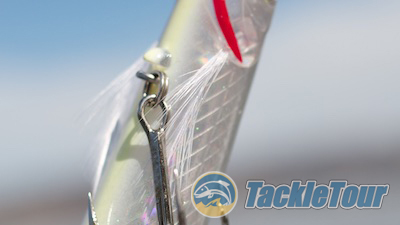 This keeps the bait from tumbling and helps it cut through the air with ease on each and every cast. This is an extremely easy and fun bait to cast. A look at The One's head design. 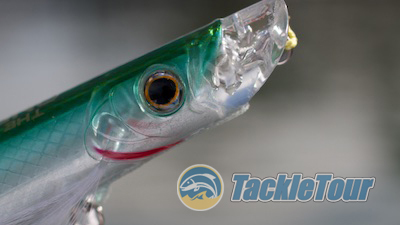 Ease of Actuation : The first check with any topwater bait, of course, is how easy is it to make it dance or swim the way it's supposed to - or rather, in a manner that will trigger strikes? The One dances very easily side to side on a medium to quick paced twitching of your rod tip - especially if you're using nylon monofilament. It will dance with braid and even fluoro too, but it dances more easily and with better quality of movement on mono. I also preferred to fish this bait on a snap. And the all important mouth of this pencil popper bait. Quality of Movement : Speaking of movement, The One moves from side to side very much like a cigar bait only with the tell tale spitting of water as it dances. It's movement is pretty typical of a pencil popper. Look closely at the hook ties at the bottom of the bait. See those plastic nubs? 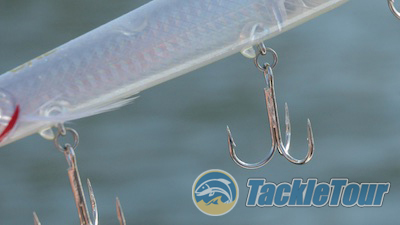 They help keep the hooks from swinging into each other and fouling the bait. Position at Rest : At rest, you'd think those big weights in the back of the bait would pull the tail into the water, but The One actually floats pretty parallel to the surface of the water. This probably explains why it walks so easily. A close up of the faux-pectoral fins on The One. Next Section: A look inside "The One"